Divine Chocolate | Extra Fair Trade! Fair Trade. We’ve all come across it but how many of us have much of an understanding, beyond a short soundbite, of what it actually means in practice? And are all Fairtrade products equal or are some more fair trade than others? Having missed Chocolate Week (only I could book a holiday that took me out of the country for the entire event) I asked the people at Divine Chocolate if they would be willing to help me understand more about Fairtrade in general and how it works in their business specifically. They kindly invited me to Divine HQ near Tower Bridge and we got talking chocolate. If you’re interested in what I learned, read on. The story starts in 1993. The Ghanian cocoa market, which had previously been in the hands of the government, was opened up by license to private organisations for the first time. With help from Twin Trading (a registered charity and trading company that also helped set up Café Direct), SNV (a Dutch NGO) and a forward-thinking representative on the Ghana Cocoa Board, a group of cocoa farmers created a co-operative to collect and sell their cocoa for the benefit of the member farmers. They called the co-operative Kuapa Kokoo, meaning “Good Cocoa Farmers Company” in the local language, Twi. The idea of farmers working for themselves, looking after themselves, in a co-operative organisation was quite an unusual idea. But it wasn’t long before the farmers began to reap the benefits of working together and they quickly built up a strong reputation for quality, efficiency and reliability. Kuapa Kokoo today consists of the Farmers Union (which runs local, regional and national elections for representatives to run the co-operative on a democratic basis), the Farmers Trust (which distributes money for community projects), the Credit Union (which provides financial services for the farmers) and the trading arm itself. Kuapa Kokoo is a co-operative of 45,000 farmers in 1,300 villages right across Ghana’s cocoa growing areas. Between them they produce approximately 8% of Ghana’s total and 1% of the world’s cocoa crops. A central tenet of Fairtrade is that buyers pay a fixed price, calculated to ensure a decent living for the farmers and producers. In the case of cocoa, world market prices have fallen as low as $1000 per tonne in recent years, but the Fairtrade price is set at $1600 per tonne. At the moment, world market prices happen to be high but the advantage of Fairtrade is the consistency of income in a constantly fluctuating market. On top of that is the $150 premium paid on each tonne purchased, which is invested in farmer support and community development programmes ranging from building primary school classrooms, constructing wells, and investing in corn mills to gender awareness and women’s empowerment workshops to seminars on issues such as nutrition, child care, health and finance. But why do prices for cocoa vary so much? One reason is that quality varies a great deal too. It’s easy to take shortcuts such as rushing fermentation by using fire to speed up the drying time (which can impart an unpleasant smokey taste to the cocoa). Kuapa Kokoo take pride in doing a proper job to produce higher quality results. And as each sack is coded to the village in which it was made, if it’s not up to scratch, it’s sent straight back! Additionally, in exchange for those Fairtrade prices, Kuapa Kokoo must ensure that their production methods meet internationally audited conditions regarding, for example, minimum health and safety conditions. They are also obliged to ensure that each producer receives a guaranteed price for their goods and the security of long-term trading contracts. While intensive, un-shaded cocoa farms boast higher yields initially, these deteriorate rapidly leading frequently to the abandonment of farms and continued deforestation as new farms encroach onto forest reserves. As Kuapa Kokoo wants to ensure longterm income for it’s members, it’s cocoa is grown in the shade. Shaded systems also mean retaining a greater biodiversity, though of course, only a fraction of what is found in virgin rainforest. It’s about finding a realistic balance between environmental conservation and the needs of local communities to make a living. Until recently, only 10% of Kuapa Kokoo’s output was sold on a Fairtrade basis as the Fairtrade market, whilst growing, remains small. Given that 100% of their cocoa meets the required standards, the aim is to sell much more of it to Fairtrade buyers. You may already know about Cadbury’s recent switch to Fairtrade cocoa for their Dairy Milk chocolate – the good news is that they are buying their Fairtrade cocoa from Kuapa Kokoo, which more than doubles the amount Kuapa Kokoo are selling at Fairtrade prices. At a 1997 Kuapa Kokoo AGM it was agreed that the best way to to increase the income of the co-operative’s cocoa producers would be to establish their own branded chocolate for sale in the UK chocolate markets. Much of the profit in chocolate is not in the farming, but in production, so it made a lot of sense to expand into that side of the chain. In 1998, with backing from Twin Trading and The Body Shop (not to mention support from Christian Aid and Comic Relief), Kuapa Kokoo established The Day Chocolate Company. 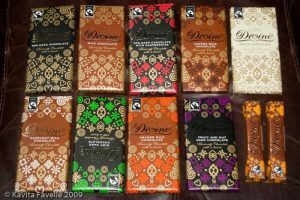 They soon created and launched Divine Fairtrade chocolate, a brand now available in supermarkets throughout the UK. The company itself was renamed to Divine Chocolate Ltd in 2007. Initially, Kuapa Kokoo owned 33% of the chocolate company (with the rest being owned by Twin Trading, The Body Shop and other investors). That went up to 45% in 2007 when The Body Shop gave (not sold) their 12% to Kuapa Kokoo just before they sold their business to L’Oreal. So the income stream for Kuapa Kokoo is three-fold: They receive the Fairtrade price for their cocoa, along with the premium. They take 45% of the profit dividends from Divine Chocolate Ltd. And Divine also give 2% of their turnover to a Producers Support & Development fund which, like the Fairtrade premium, is used to improve farmers’ skills and productivity, increase efficiency within the co-operative, help finance the running of the co-operative (and the democratic process). And of course, there is also the advantage that comes from a stronger understanding of the chocolate industry! The more farmers understand about the chocolate-making process and how the quality and processing of cocoa impacts the final product, the better equipped they are to produce even better cocoa. On top of that, Kuapa Kokoo is better able to obtain more favourable financing deals – paying 5% rather than 25% interest on loans, for example! So this is how Divine Chocolate stands out from other Fairtrade options for me. Of course, I applaud Cadbury’s decision to make it’s Dairy Milk chocolate Fairtrade. Cocoa farmers will receive the Fairtrade price and premium for their beans. But all the profits from producing and selling the chocolate are Cadbury’s alone. Divine Chocolate is what I’m calling Extra Fair Trade as it feeds more money back to the cocoa farmers. Kuaka Kokoo’s motto is “Pa Pa Paa” which means “the best of the best of the best”. That applies to Divine Chocolate too, who aim to produce delicious, high quality chocolate using natural ingredients. In the short time since they launched the brand, they have grown their range to include a wide selection of flavours and some lovely gift products too. I think I first came across Divine at Destinations travel show a few years ago. For the last few years I’ve bought boxes of 10 x 100 gram bars of the coffee flavour each time I’m at the show. More recently, I’ve been trying other flavours including dark chocolate with raspberries, white chocolate with strawberries, butterscotch milk chocolate, dark fruit and nut, hazelnut milk chocolate, dark mint chocolate and orange milk chocolate. I’m also a huge fan of their dark chocolate mango slices and apricots; the apricots are Fairtrade from Pakistan and the sun-dried mangoes are Fairtrade from Burkina Faso. Soft, chewy fruit coated in rich, dark chocolate – what’s not to like? I’ve not yet tried their cocoa powder, but it’s on my list. If you’re interested in exploring their products yourself, they have a Divine shop website, here. I’ve also been experimenting with using Divine chocolate in cooking. Thus far I’ve had one failure and one success. Read more about both in an upcoming blog post. 9 Comments to "Divine Chocolate | Extra Fair Trade!" I probably don't buy enough fairtrade stuff but I will make a point of buying this divine chocolate as I know I've seen it around so no excuses! Very interesting posting, just got some of these lovely chocolates at the Taste of Christmas this afternoon… they are delicious. Reiko tells me she knows you, it is a small world isnt't it? Very nice post.. and what a very interesting subject!